Barely containing my childlike excitement, I lean sideways in my seat, pressing my face against the cold surface of the small window, straining to peer through the thick clouds, eager for my first sight of "Africa". Finally, as the plane begins its descent to the Hoedspruit airport, the clouds start to separate and I can see clearly the golden grassy African plains, the setting for my family's safari adventure. The grassy plains stretch for miles, broken only by scatterings of cacti, thorny bushes, and trees. Out of this expanse, I observe as a black dot appears and then stretches to form a line, lengthening until it becomes an airstrip. I feel the familiar jolt as the plane's wheels hit the tarmac and soon the loud whooshing sound of the plane's brakes fills the air. The plane rolls to a halt. Still peering out the small plane window, I look intently for any sign of civilization, especially for a "standard" airport terminal. Once the seatbelt lights are extinguished and it's safe to leave my seat, I fall in line behind the other passengers, making my way through the aisle of seats and down the narrow stairs, gripping the handrail with one hand, while holding tightly to my small carry-on case with the other. No terminal in sight, I blindly, along with my mom and sister, continue following the others, walking towards the end of the runway. Finally, the vague shape of a building appears, almost completely camouflaged with its blend of desert colors and fenced wall of what looks like bamboo. Still following the lead of the people in front of me, I walk through an opening in the bamboo fence. Looking to the left, my gaze is caught by a line of safari lodge drivers with their uniformed khaki shorts and shirts, standing along the sidewalk near the entrance to the building, holding signs clearly labeled with names. Smith, Johnson......For a moment, I experience that same old nervousness in the pit of my stomach, that fear of being left or somehow forgotten...Jones, Miller....I sigh in relief to see our name.. I don't ever want to repeat the transportation mixups that occurred in our recent international trip to Dubai. So many times, due to language barriers, we were left waiting, tired and stressed, not knowing if someone was going to show. Later,safely in the company of our driver, my mom, sister, and I wait on the small sidewalk outside the terminal entrance ,watching with humor as a large green tractor pulls up with a small trailer, luggage in tow. As it rolls to a stop, our driver stands alert as the luggage is unloaded, listening for a word from us, "There it is; that's mine! The pink tag...that's Britt's!". He reaches for our luggage and then, places it in a huge white van with the words Thornybush printed on the side. Settled in our seats, having been made comfortable with an offering of cold bottled water from a cooler, we are finally on our way, focused intently on the scenery as the vehicle takes us farther and farther into unknown territory. Tall wire fences line both sides of the road. At intervals, signs appear identifying entryways to various game reserves and lodges. After traveling for some time, the driver abandons the paved road in favor of a pale dusty, gravel one, the remainder of the lodge trip rough and shaky to say the least, the road marked by uneven ridges. At last, the moment we have been waiting for..."safari" animals, zebras! At first sight, our immediate impression is amazement! Up close, in the wild, the zebras not only seem much larger than the ones we have seen in zoos, but also more vivid in color. The stark black and white patterned coats were mesmerizing. I could understand how easily the designs could confuse predators in the crisscrossed thorny branches of the African plains. Incredibly, those same vivid stripes were echoed in the short seemingly-manicured stiff-haired mane. The beautiful eye-catching patterns reminded me of designs I had once viewed through the lens of a kaleidoscope. After driving through what seemed a maze of roads heading off in different directions and gaining access through a security point, the vehicle rolled to a stop at what I learned was the main Thornybush lodge. Smiles and hellos as well as small stemmed goblets filled with homemade lemonade awaited us, the presentation intriguing with tiny edible flowers delicately threaded on toothpicks and suspended on the glass rims. After the brief interval of refreshment, we resumed the second leg of our journey. Transferring to another vehicle, a long army green land rover with the words Shambalala on the door, we were introduced to Ryan, our ranger and guide for the safari. A glimpse into Ryan's personality and sense of humor was soon evident as the rough road led to one bounce too many, sending my small black suitcase flying through the air. With an apology and a sparkle in his eyes, he quickly brought the land rover to a halt, jumping down and retrieving the case, dusting off the thin layer of sand and gravel. I could not help but laugh as the incident emphasized to me the true ruggedness of the safari experience. Traveling in an open vehicle with cases piled in the back, I could only imagine the early days of travel when flying luggage may have been a common experience. In sharp contrast to the rugged travel, my first experience at the Shambalala lodge was the hospitable presentation of a silver bowl filled with moist cloth hand-towels for refreshing and cleansing after the long trip. It felt very much like "pampering" and I liked it! "Ready for a tour of the property?'... We eagerly followed our guide, not at all anticipating what we would see next. Africa came to us....in the form of a warthog crossing the sidewalk, and then, all of a sudden an antelope appearing nearby. Then, the quiet was interrupted by sounds from a tree branch above us alerting us to the presence of another animal, a cute little monkey, just like ones I've seen in the zoo! However, I was disappointed as he scampered off before I could get my camera out, perhaps a bit camera shy , not wanting to stay close long enough for a photograph. Lulled by the peacefulness of the animals we had met so far in our tour of the lodge grounds, I strolled confidently ahead only to draw back startled at the sight of a snake on the path in front of me. Quick to assure us that the snake was not real, the guide explained us that the rubber imitation was deliberately placed outside the open doors to the library to discourage unwanted visitors, in particular, the bold baboons. They are notorious for ransacking belongings, searching for anything associated with food. To further emphasize this fact, we are warned to be sure to secure our rooms when leaving them, making sure to slide down the large metal bar that makes up the old-fashioned lock on the doors. The last stop on the tour was each individual's room, which turned out to be independent structures resembling small English thatched roof cottages. Each room's or cottage's interior boasted a rugged stone fireplace, a dreamy bed with sheer white mosquito netting, large footed bathtub, and an indoor as well as outdoor shower for the full nature experience. The experience continued as the drapes were drawn back to reveal a full wall of windows with a sliding glass door that opened up to a wooden deck. The deck overlooked the huge lodge watering hole, providing the perfect spot for viewing wandering wildlife. A few minutes later, I am left alone to unpack and freshen up, able to relax briefly and absorb all of the newness of the experience before making my way to the main dining and deck area for "tea." Not knowing what to expect, "tea" turned out to be an elegant presentation of appetizers and mini-desserts, all of which were delicious. During this time, the chef introduced himself as well as the dinner menu for each night. "Tea" also was a social gathering for the safari guests, giving us time to talk and become acquainted with each other before leaving for the nightly safari. Monday night my parents and I were watching the Masterchef season 3 episode where the contestants had to make homemade apple pies. It happens to me every time I watch food shows; I start craving the foods that are being cooked on tv. This can be a bad thing when I am watching the cooking shows late at night. Haha! The apple pies the contestants were making brought back memories of my mom’s fried apple pies. I would watch her crimp the edges of the pies with a fork then lightly pan fry them in a cast iron skillet. She finished the pies with a dusting of cinnamon and sugar which took them over-the-top. In the South, women grow up in the kitchen watching their moms and grandmothers cook. This holds true for my mom who learned how to make fried apple pies from her grandmother and for me, who learned how to make them from my mom. I wish I could have sampled my great grandmother's (my mom's mom) generously filled fresh apple pies but my memories only take me as far as picking the apples from her trees. I can only imagine the aroma of fresh apples and cinnamon simmering in a pan on her stove. What could possibly be better than a fried apple pie? Peaches. I love peaches and when they are in season I can eat them any and every way, though there is one way that takes the peach, my not so fried peach pie. I know you are thinking there isn’t anything better than a fried pie and don’t tell me a baked one will be as good but it is. My baked “not fried” peach pies are just as flaky and crunchy as fried pies. The secret is in the dough. To follow up my success in using olive oil in making biscuits (check out one of my previous blog posts for the recipe), I decided to try using olive oil in my pie dough. Why bother using olive oil? It is a pantry staple. Gone are the days of not being able to whip up a home baked goods because you don't have butter in your refrigerator. Olive oil is reigning supreme in my kitchen. I conducted my baking test with the olive oil to determine if I could achieve the same flaky texture of a pie crust without butter. For testing purposes, I used California Olive Ranch Extra Virgin Olive Oil. Knowing the importance of using ice cold ingredients in pie dough, I contemplated what I would do with the olive oil. Should I freeze it into a solid? Should I chill it until ice cold? I decided ice cold so I placed the bottle of olive oil in the freezer for 5 minutes to chill. If kept longer in the freezer, it would have frozen into a solid. I worked the olive oil into the dry ingredients with a fork, just like I would with butter. It produced this crumbly texture. Then I added ice cold water to form the dough. What I couldn't believe is how simple it was to make these homemade pies. There is something nostalgic about making baked goods from scratch. I don't think there is anything that could make these pies any better.....though a scoop of ice cream or dollop of whipped cream couldn't hurt, after all they are baked. haha! My mom and I talked about all of the different types of pies we could have by changing the filling. Strawberry, blueberry, or blackberry pies would be great to add to my 4th of July menu. Preheat the oven to 375 degrees. Lightly grease a baking sheet with cooking spray. In a medium bowl, sift together flour, salt and baking powder. Add the sugar. Work in the olive with a fork until fine crumbs are produced (as shown above). Mix the water into the crumble mixture until it is absorbed, then knead lightly (I do this with just one hand, in the bowl) until the dough forms a ball. Cover with plastic wrap and refrigerate for 30 minutes. Meanwhile, make the filling. Melt the butter in a medium saucepan over medium heat. Sprinkle the brown sugar in the pan. Once the sugar begins to melt, lay the peach slices in the pan. Sprinkle the cinnamon over the peaches. Cook the peaches for 2 minutes on each side. Transfer to a bowl and set aside until to cool to room temperature. Turn the dough out on a lightly floured work surface. Sprinkle a little flour over the dough. Using a floured rolling pin, roll the dough to about 1/8-inch thick sphere. Using a 4-inch round cookie cutter, cut small spheres. Form the scraps of dough together and roll out again. Repeat. Until about 10 spheres are made. If dough is thick, pat out until a little thinner. Fill one side of each sphere with some of the peaches. Fold the dough over and pinch closed. Using a fork, press around the edges of each pie to seal. In a small bowl, combine the egg and 1 Tbsp. water. Place the pies on the baking sheet. Brush each pie with a little of the egg wash. Bake for 20 minutes. Immediately transfer the pies to a cooling rack. Last Sunday after only being home for 3 days from my trip to South Africa, I awoke craving a scone. To feed my craving, I made a small adjustment to my biscuit recipe and called it a day. Sadly to say it was not the same. It wasn't that the biscuit was not good but I had the memory and flavor of a scone. The difference being scones are flakier and lighter than biscuits. I wanted to master making scones so I was back at making them on Saturday. I researched online South African scone recipes and traditions associated with them. What I found is that South Africans usually learn to make scones from their grandmother and/or mom. The tradition of making them on Sundays is very popular. How fascinating! My great grandmother would always make her fluffy biscuits on Sundays. I would watch and learn from her the art of making Southern biscuits. When looking through the various scone recipes online I found that the addition of an egg and milk is what makes scones differ from biscuits. After deliberating over the ingredients and the amounts, I baked my first batch of scones. The end result wasn't what I was looking for. I abandoned the challenge that day and thought more about what I would do differently. Waking up this morning with an excitment for creating scrumptious flaky scones, I flew into the kitchen. "Baking is a science." I have heard this statement over and over but it doesn't really resonate until I am experimenting in the kitchen. How do I make my scones flaky and light and not cakey and dense? After some deliberating, I came up with what I thought would be the perfect ratio of flour to butter and egg to milk. For the milk, I went Southern style using buttermilk. Once the ingredients were incorporated, the dough produced was soft and pliable. It was much easier to work with than the dough from Saturday's batch of scones. The timer sounded and I opened the oven door with anticipation. The scones were risen nicely but the tops were not browned. Hmmm....this is why I didn't bake all of the dough. To fix this batch, I broiled the tops. They tasted great but the tops needed to have gotten golden brown during baking. Third time is a charm! Baking the scones at 425 degrees F was the perfect degrees but the problem with the 1st batch was that the scones were not golden brown. The solution was to brush the tops with the egg instead of the buttermilk. The result was flaky and light scones with beautiful golden brown tops which lended both a light crunchiness and appeal. I can thank chef Reza (UK Food Network's Spice Prince) for introducing me to the proper way to indulge on a scone. After conducting a cooking demonstration at one of the theatres in the Good Food and Wine Show in Cape Town, I relaxed in the lounge with my mom and sister. Then enterd Reza with his explosive energetic personality. He took one look at the tier of freshly baked scones, provided by the culinary students, and dove in. "Where's the clotted cream?" he exclaimed. "The what? I said in bewilderment. In a second, he was out the door and on a mission to find clotted cream. With a smile on his face and a bowl of fluffy mile high cream in his hand, Reza sat down and continued to compose his scone. First smearing the cream then the strawberry jam. I had never seen anything like it except maybe strawberry shortcake which is whipped cream and strawberries on top of a scone like baked good. My first thought though is a biscuit which I have never eaten cream on. I didn't even know what clotted cream was. Reza's face lit up as he enjoyed his concoction. Without skipping a beat, Reza repeated the process three more times to prepare a scone for my mom, sister, and me. After one bite, we understood what the hype was all about. At home where clotted cream is not so easily found, I prepared my own cream by beat whipping cream to soft peaks then incorporating greek yogurt. My scone wouldn't be complete without homemade strawberry jam. My foodie memory enveloped me and I was back in South Africa. Sift the flour and salt in a large mixing bowl. Rub the butter into the flour with your fingers until it is the size of breadcrumbs. Stir in the sugar. Stir the egg mixture into the flour mixture and mix until just combined. Then using your hands, lightly knead the dough together to form soft dough. Place the dough on a floured surface and shape into a sphere then pat down about ¾-1 inch thick. Using a floured 2-inch cookie cutter, quickly push the cutter down through the dough and lift without twisting. Cut out scones, reshape dough, and repeat. Creates about 14 scones. Place on the greased baking sheet and brush the tops of the scones with the beaten egg. Bake for about 7 minutes. Transfer immediately to a wire rack to cool. Serve warm with cream or butter and jam/jelly. 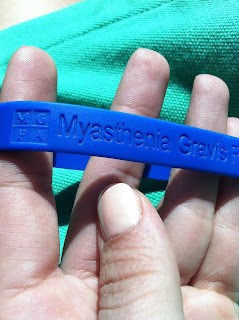 June is Myasthenia Gravis Awareness month. Myasthenia Gravis (MG) is an autoimmune disease specifically neuromuscular. My dad was diagnosed with MG a year from January. My family and I had never heard of MG at the time of his diagnosis. It was scarey because my dad had been experiencing symptoms such as double vision, drooping of his eye lids, and fatigue for months before he was diagnosed by a neurologist. The next several months were spent researching MG. Hearing that this disease is treatable but uncureable was discouraging. My family prayed together and asked the Lord's guidance on treatment. Fast forwarding to now, my dad has experienced a lot since then from visiting Mayo Clinic, testing different medication, and experiencing and MG crisis. He is now doing so much better. We are praying he will go into remission. I know the Lord has his hand over my dad. I try to help my dad in any way that I can. When he began taking Prednisone, a steroid, I educated myself on the side effects of the medication. Diabetes, high blood pressure, and increased appetite are a few of the possible side effects. To help my dad, I began cooking low sodium and low sugar foods. I created healthy snacks for him as well to cope with the increased appetite. This month I want to bring as much awareness as I can about MG. I am visiting news stations in the South to share about my dad's disease and the foods that I prepare to help him. 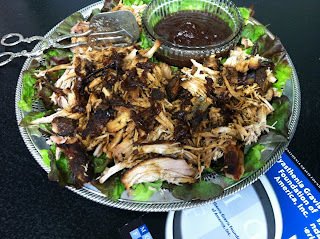 This morning I shared my recipe for my low sodium/low sugar BBQ Pulled Pork Tenderloin on Birmingham's ABC station. My dad was born and raised in Memphis, TN and loves his bbq. This recipe allows him to enjoy his bbq. In a small bowl, combine the next five ingredients. Rub the spice mixture over the pork. Coat the bottom of a large cast iron skillet with the canola oil. Heat the oil over medium-high heat. Once hot, place the tenderloin in the skillet and cook for about 1 minute on each side to form a crust and seal in the flavors. Remove the skillet from the heat. Top the tenderloin with the onion slices. Pour the apple juice and water in the skillet and cover with aluminum foil. Bake for about 4 hours or until the pork pulls apart with a fork. Allow to rest for 5-10 minutes. Using two forks pull the pork apart. For the BBQ sauce, combine the tomato sauce, apple juice, and cranberries in a small saucepan. Cook for 8-10 minutes, stirring occasionally. Process the tomato mixture in a food processor until smooth. Transfer the mixture to the saucepan. Stir in the balsamic vinegar and honey and cover with a lid. Cook for 10-15 minutes over medium-low heat, stirring occasionally. If more sweetness is desired, add more honey. 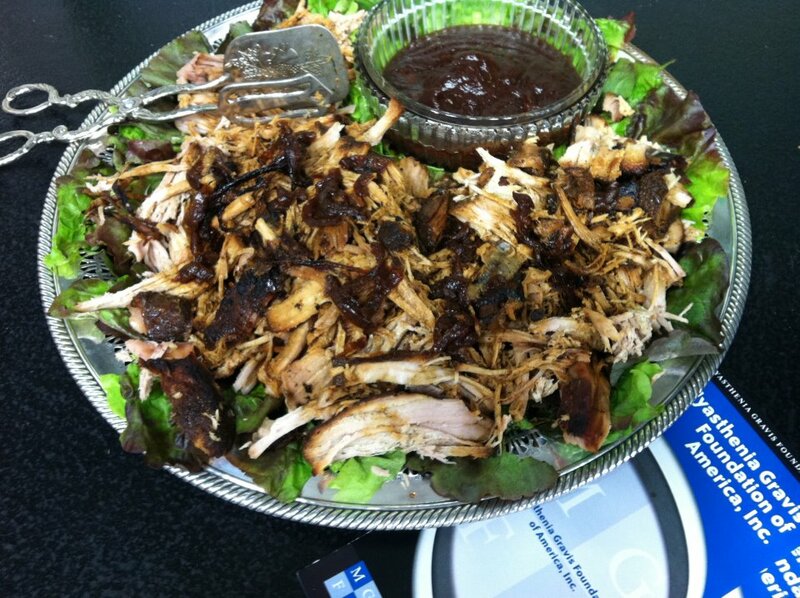 Serve the pulled pork with the BBQ sauce.